The University of Missouri-Kansas City School of Medicine and Saint Luke’s Hospital of Kansas City will present the Saint Luke’s Marion Bloch Neuroscience Institute, 2014 Neuroscience Symposium on Sept. 19 at the Bartle Hall Convention Center. The symposium is for primary care physicians, family physicians, neurosurgeons, neurologists, neurointensivists, psychiatrists, nurses, case managers/social workers, pre-hospital personnel, and other health care professionals. It will focus on the multidisciplinary approach to patients with neurologic disorders and review current treatment paradigms. Nursing and pre-hospital care breakout sessions will be tailored to address inpatient nursing challenges and the diagnosis and management of neurologically injured patients for first responders. To register and learn more go to https://cmetracker.net/UMKC/Catalog (case sensitive) or contact the University of Missouri-Kansas City Continuing Medical Education Office: 816-235-6808 or cmeoffice@umkc.edu. This symposium is jointly provided by the University of Missouri-Kansas City School of Medicine and Saint Luke’s Hospital of Kansas City. Two new faculty members have joined the School of Medicine’s Masters of Medical Science Physician Assistant program as it prepares to welcome its inaugural class next January. 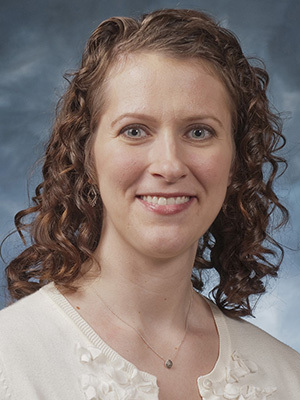 Holli Paulk, M.B.A., M.P.A.S., assistant teaching professor, will serve as the program’s clinical coordinator and be involved in curriculum development, lectures and clinical instruction. Brad Dirks, M.Ed., P.A.-C., also an assistant teaching professor, will be involved in curriculum development and didactic instruction. Paulk received her B.S. Physician Assistant degree and an M.B.A. from South University in Savannah, Ga., received a master’s degree in Physician Assistant Studies from the University of Nebraska Medical Center in Omaha. Her 10-year career as a Physician Assistant has featured a focus in gastroenterology, hepatology, liver transplant and also in health care administration. Paulk came to Kansas City from Emory University Hospital in Atlanta, and currently works with the liver transplant program at Saint Luke’s Hospital. Dirks graduated from the Nebraska Medical Center Physician Assistant program and obtained a Masters in Education/Counseling from Wichita State University. He has worked in Family Practice, Orthopedics and Neurosurgery. 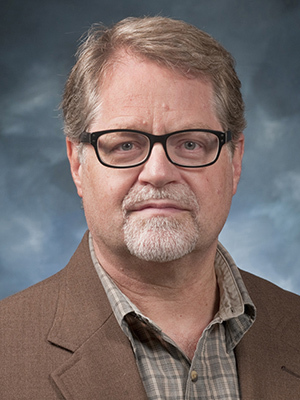 For 11 years, Dirks was the associate director of the Psychiatry Fellowship for Physician Assistants at the Cherokee Mental Health Institute in Cherokee, Iowa, and managed an inpatient and outpatient psychiatry practice. He lives with his wife Kathleen in Belton, Mo., and has three adult daughters. School of Medicine MSA students spent an evening at Worlds of Fun dressed as zombies to help raise money for a global health charity. Pictured are: (front) Jenna Gaughan, Abby Gezella, Juveria Nayeem, Courtney Haanpaa; (back) Landon Streed, Colin Warnock, TJ McManus, and Amanda Sharp. MSA students spent an evening at the Harvesters food network preparing food and drink packages for local food banks. Pictured are (front) Juveria Nyeem, Abby Gezella, Jenna Gaughan, Kyle Harlan; (back) Colin Warnock, Amanda Sharp, Courtney Haanpaa, TJ McManus, Landon Streed, and Tyler Werth. 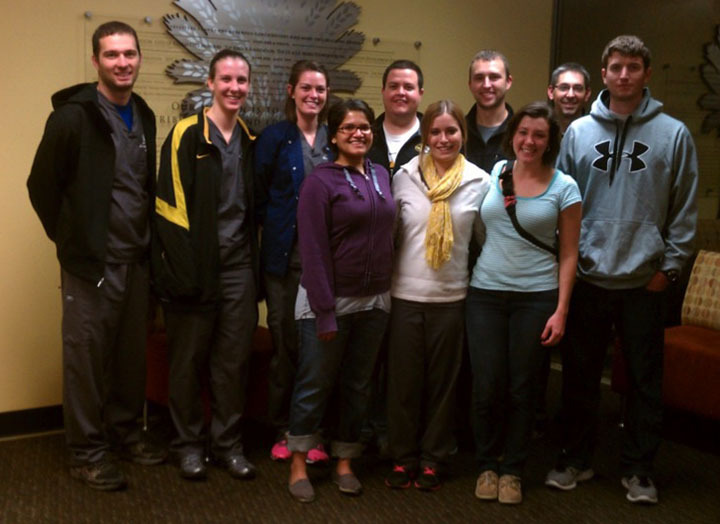 From raising money for a global health charity to helping with a community food network, students from the School of Medicine’s Master of Science in Anesthesia program have busily put their competitive nature to work in an effort to capture the American Academy of Anesthesiologist Assistants Cup, a competition to recognize the most community-involved Anesthesiologist Assistants program in the country. 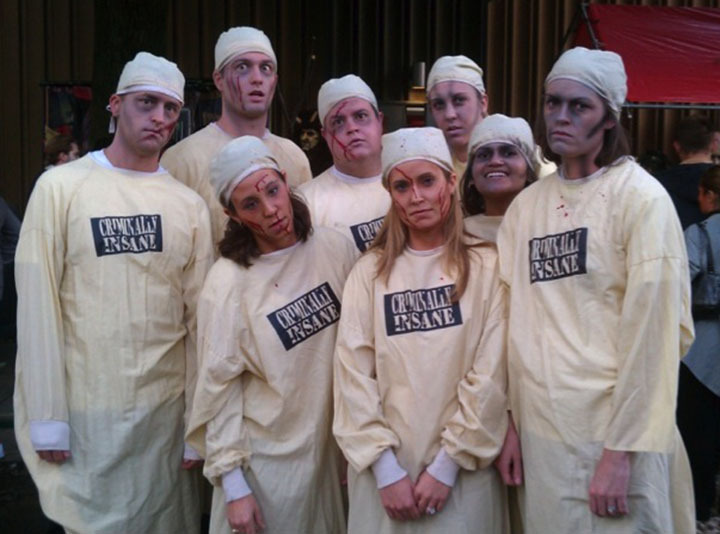 AA students from the School of Medicine recently dressed as zombies and spent an evening scaring guests at the Worlds of Fun Halloween Haunt, helping with admissions and directing guests inside the park. The event was part of a fund-raiser for the Lifebox Foundation, a global health charity that uses technology and training to make surgery safer in low-resource countries across Africa, Asia, South America and the Western Pacific. Funds are needed to provide vital pieces of medical equipment such as the pulse oximeter. Students spent several hours one evening at Harvesters, a community food network, packaging soda and water for distribution to local food banks. They also donated time to work with a local church’s fall festival, which included participating in activities such as playing basketball with children and helping prepare and serve a meal. The UMKC MSA program was recognized for the second straight year for having 100% PAC participation at the American Society of Anesthesiologists annual meeting. Last year, the program was one of two such AA programs recognized, and this year it was one of four. UMKC was also the only school that had 100% participation from both its AA training program and anesthesiology residency programs. It was the second year for that recognition as well. The School of Medicine’s new Master of Medical Science Physician Assistant program cleared its final hurdle for starting classes this winter when the program recently received official written notice of provisional accreditation status from the Accreditation Review Commission on Education for the Physician Assistant (ARC-PA). Provisional status indicates that the plans and resource allocation for the proposed program appear to demonstrate the program’s ability to meet the ARC-PA standards if fully implemented as planned. Provisional accreditation does not ensure subsequent accreditation status and is limited to no more than five years from matriculation of the first class. Kathy Ervie, M.P.A.S., P.A.-C., program director, said the School received an earlier email notification that the written approval was forthcoming. Provisional accreditation is required before a program can officially admit students and begin classes. Ervie said the program would begin with an inaugural class of 15 students. The School received nearly 100 applications to be part of that first class and about 40 were interviewed. At least 80 percent of the class will come from the instate application pool, Ervie said. “We have been very pleased with the number of applications we’ve received and they have been exceptional,” she said. The first class is scheduled to begin on Jan. 14. The University of Missouri-Kansas City School of Medicine is now taking applications for its new physician assistant (PA) program. 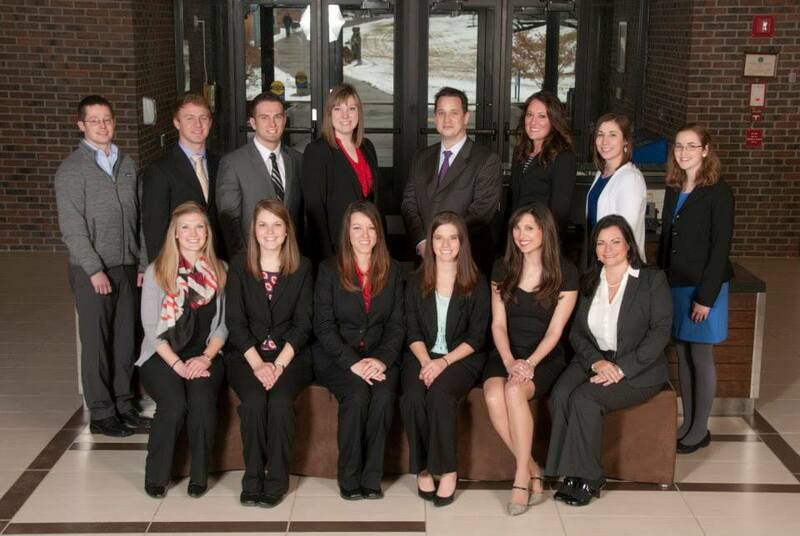 The master’s degree PA program, scheduled to start classes in January 2014, is the only one in the Kansas City area. The closest accredited PA programs are Wichita State University in Kansas and Missouri State University in Springfield. Neither is administered through a school of medicine, where future physicians and PAs learn side by side. The training model at the UMKC School of Medicine mirrors the team-based approach of PAs working under the supervision of a physician to improve coordination of care and patient outcomes. Because of their general medical background, PAs have flexibility in the types of medicine they can practice. PAs perform physical examinations, diagnose and treat illnesses, order and interpret lab tests, perform procedures, assist in surgery, provide patient education and counseling and make rounds in hospitals and nursing homes. All 50 states and the District of Columbia allow PAs to practice and prescribe medicine. Missouri Gov. Jay Nixon recently signed a bill into state law that opens the door for PAs to more readily provide badly needed service to areas of the state where health care is lacking. HB315 will go into law on Aug. 28, changing the required on-site supervision of PAs by a licensed physician from 66 percent of the time to four hours for every 14 days the PA provides clinical service. The previous supervision requirement was one of the most strict in the nation, forcing many PAs to leave Missouri for other jobs. Ervie said the law will open the door to making health care more readily available in areas of the state that can’t afford both a physician and a PA.
PAs were created in the mid-1960s due to a shortage of primary care physicians. The U.S. Bureau of Labor Statistics predicts PAs will be the second-fastest-growing profession in the next decade, increasing from 74,800 in 2008 to 103,900 in 2018. The median salary for a PA in 2010 was $86,410 per year. In 2010, it was the No. 2 best job, according to Money magazine. The UMKC PA program has applied for accreditation from the Accreditation Review Commission on Education for Physician Assistants (ARC-PA). 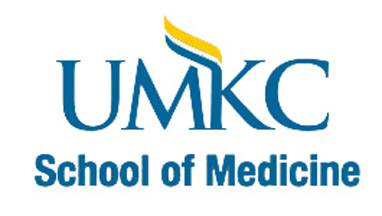 The deadline for applications for the UMKC School of Medicine PA program is Aug. 1; students may matriculate pending provisional accreditation approval by the ARC-PA at its September meeting.A bachelor’s degree is a requirement, but not necessarily in life science. Up to 15 applicants will be selected for the program. For more information, go to www.med.umkc.edu/mmspa or call 816-235-1870. The School of Medicine has hired two key faculty to lead the new Master of Medical Science program that will train skilled physician assistants (PA) to meet local and national health care needs. Kathy Ervie, M.P.A.S., P.A.-C. will serve as program director and Beverly Graves, M.D., ’83, will serve as medical director of the School’s PA program. Ervie completed her Physician Assistant training at Butler University and received her Master’s in Physician Assistant Studies from the University of Nebraska. 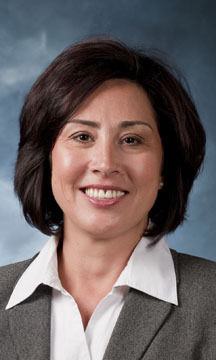 She has practiced in the areas of orthopaedic and cardiothoracic surgery with staff appointments at Saint Luke’s, North Kansas City, Research and Kansas City Orthopaedic Institute. 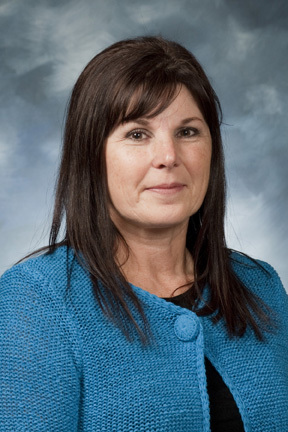 In addition to serving as mentor and preceptor to PA students, she has also served as past president of the Missouri Academy of Physician Assistants. Graves, a School of Medicine graduate, completed her residency in pediatrics at Children’s Mercy Hospitals and Clinics. 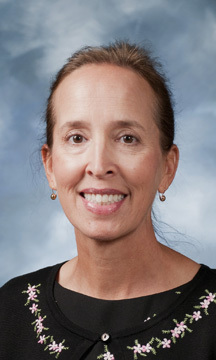 She joined the School of Medicine in 1986, previously working as a pediatrician and clinical assistant professor of community and family medicine. She also served as an affiliate staff pediatrician at Children’s Mercy and is a neonatal resuscitation program regional trainer. 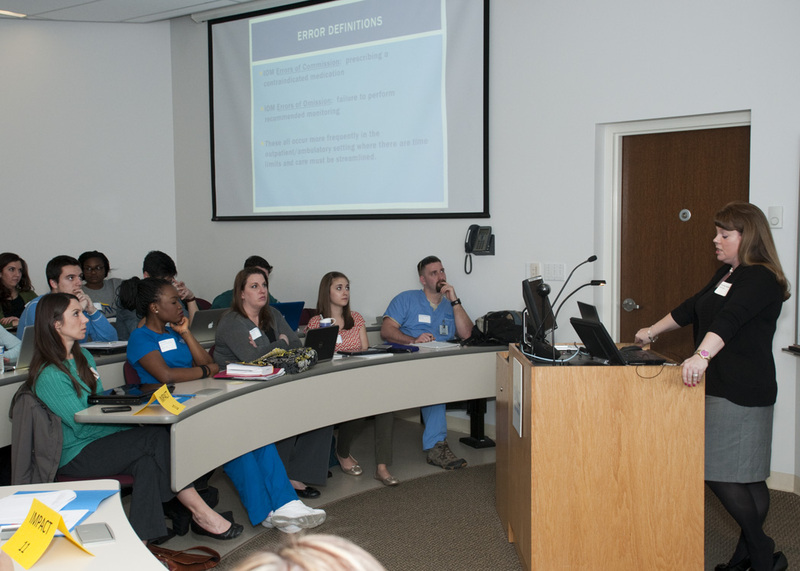 The PA program at the School of Medicine is designed to address significant local and national shortages of physicians and other health care providers. Saint Louis University and Missouri State University offer the only other degree-granting PA education programs in Missouri. UMKC School of Medicine has applied for provisional accreditation from the Accreditation Review Commission on Education for the Physician Assistant (ARC-PA), and anticipates matriculating its first class in January 2014, pending provisional accreditation in September 2013. Provisional accreditation is an accreditation status for a new PA program that has not yet enrolled students, but at the time of its comprehensive accreditation review, has demonstrated its preparedness to initiate a program in accordance with the accreditation Standards. The UMKC School of Medicine’s Master of Science in Anesthesia Program Class of 2012 will offer a class in Hands Only CPR for School of Medicine staff from 10-11 a.m. and from 2-3 p.m. on Friday, May 4 in the Youngblood Medical Skills Lab (Ground Floor – School of Medicine). The class for School of Medicine staff will take approximately 50 minutes. Reservations for the class are required, but will be accepted until the day before the event. According to the American Heart Association, training in Hands-Only CPR increases the chance that a bystander will take action in a cardiac emergency. Hands-Only CPR offers an easy to remember and effective option to bystanders who have been previously trained in CPR but are afraid to help because they are not confident that they can remember and perform the steps of conventional CPR. To reserve a spot email Laura Begley begleyl@umkc.edu.